On Monday morning several passersby ducked into the alcove across the street from the Gap on Harvard Street and went to open the door to the Panera only to be greeted by a locked door and a sign. 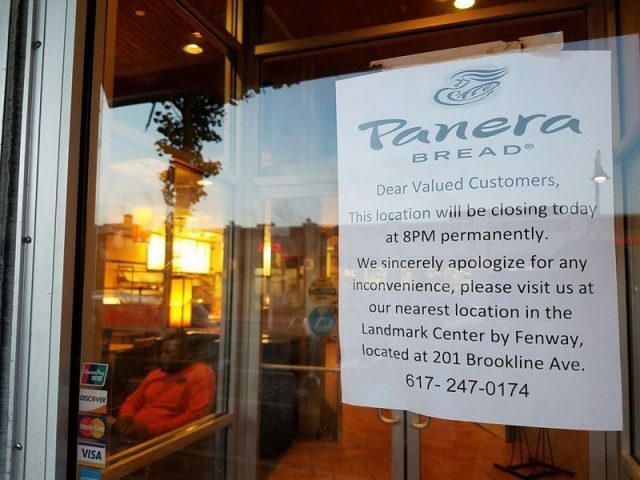 On Sunday June 18, 2017, a sign in the window of the Coolidge Corner Panera announced the location was closing. “Dear Valued Customers, This location will be closing today at 8 p.m. permanently. We sincerely apologize for any inconvenience, please visit us at our nearest location in the Landmark Center by Fenway, located at 201 Brookline Avenue,” it read. The location did not show up on the Panera corporate website. The closing comes just days after Panera released the news that digital sales – those made via mobile, web, or kiosk – had surpassed the $1 Billion mark annually and might double in 2019 for the entire company. Panera moved into the space that is now tucked between two banks in one of the largest ground-floor retail spaces in Brookline was shuttered for years after the upscale grocery store Zathmary’s closed. In 2007 Panera announced it was moving in. Since then it has been a popular spot with young and old alike. In the morning it was often packed with older folks reading papers and business people meeting up for coffee. After school it was a popular place for middle schoolers to go after school and until close, it was often filled with high schoolers and college students studying. The Brookline Chamber of Commerce held coffee networking events there every once in a while, but only found out through word of mouth that Panera was closing. “We don’t even know anything,” said Debbie Good Miller of the chamber. Panera representatives were not able to return request for comment in time for publication. When they do, we will update.